How about that for variety? The first is a short little fantasy, almost a novella; the second is a contemporary YA, and the third is a near-future politics-heavy SF novel. Why I read Sunbolt: a personal friend send me a YOU MUST READ THIS text about, not this book, but the sequel. Well, all right, then. I’d never heard of this author, but sure. And then once it was on my Kindle, well, a short book was just right when Ish and I were recently stuck at the emergency clinic for four hours. So, Sunbolt was not a story I fell hard for, but I did like it and I’m curious about the sequel, especially given that text from my friend. The story involves a young thief who involves herself with a political conspiracy, gets caught, escapes with the help of a scary soul-stealing vampire with whom she’s imprisoned, and is then seriously affected when, in desperation, she throws a large amount of magic around without being trained to handle it. There, I think that’s pretty accurate without dealing in too many spoilers. Anyway, the heart of this story reminded me very strongly of McKinley’s Sunshine, and it would be rather unlikely for any book to measure up to that one, so Khanani’s can’t help but suffer by comparison. 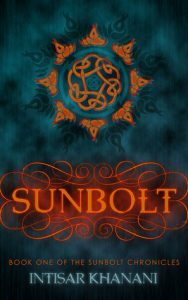 Of course Sunbolt is very different in many, many ways; the world is not the same at all and naturally the plot goes off in its own direction. It’s a decent read and, as I say, I’m curious about the sequel. I fear that for me, this title is an active turn-off. I get that it means, “As different as…” But I still think it’s a stupid-sounding title. As you all know, I don’t read a whole lot of contemporary YA, and I certainly wouldn’t have looked twice at this one just based on its title and cover. Not that there’s anything wrong with the cover, but it is so plainly a contemporary YA. But I’m perfectly willing to pick up an otherwise unappealing book when certain bloggers recommend it – particularly though not exclusively Maureen at By Singing Light and Brandy at Random Musings. 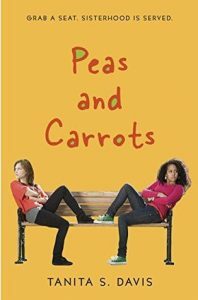 Click on the links to check out their reviews of Peas and Carrots. This is a story where Dess, a white teenager caught up in the foster care system, goes to stay with the black family that’s been fostering her mixed-race baby brother. There’s a lot of embedded issues in a situation like that, obviously, and in less deft hands you can see how it would turn into a preachy message-fic kind of story. Davis almost completely avoids that, mostly by drawing her characters really well, both the protagonists and the secondary characters; and also by keeping a tight focus on the specific, individual concerns of her two protagonists. Dess is dealing with a pretty difficult background, lingering PTSD, and hard-held mistrust of everyone. Hope, who is about her age, is dealing with a new foster sister who is admittedly pretty difficult at first. Theirs is the central relationship in the story, which is told from their alternating points of view. I didn’t really care for this story until the two girls kind of worked out their relationship. I liked them both and wanted them to be friends. Of course I knew that was going to happen, so I was patient. Once it did, I liked the book a whole lot better. Both Dess and Hope are really so well drawn, and so are Hope’s parents – and Dess’ mother, too, actually, though we see her parents only in absentia, which requires a whole extra layer of deft, doesn’t it, to pull that off. The whole story is really about family, and the details and voices in this story are so beautifully handled that all the family relationships feel completely real. It’s hard to believe these people aren’t all real and living in some nearby town. I got pretty invested, I must say, and would gladly read a sequel. Personally I think Dess was essentially hallucinating the biker gang members, but Davis never makes this clear – an ambiguity I really like – but in a sequel, I expect we would find out. Okay, now, Persona is nothing like either of the above. Oh, I get the snake on the cover now. I’d forgotten about that. This is not at all horror, btw, so if that’s the vibe the snake gives you, no. I like snakes, so I don’t have that impression personally; and incidentally a great snake identification blog I just happened across is Living Alongside Wildlife in case you’d like to check that out. But back to Persona. I really didn’t like the sample, which presented a protagonist who didn’t appeal to me in a situation that appealed to me even less. But Maureen persisted in commenting about her love for this book, so when it appeared at a sale price, I picked it up and eventually (with some trepidation) went on with it just to get it off my TBR pile. Leaving The Girls at the Kingfisher Club just sitting, even though I really look forward to reading that one. It’s odd how you may reach for a book you don’t really expect to like long before one you anticipate loving, just to get it out of the way. Or is that just me? Anyway, I wound up really enjoying Persona — and admiring the writing a great deal. I would definitely have thought about nominating it for awards this year if I’d read it earlier – I don’t think it would have bumped anything that I did nominate, but I would have considered it. 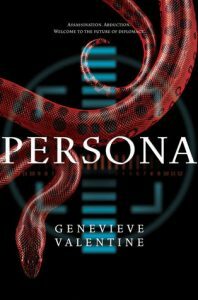 I admire the adroit way Genevieve Valentine moves back and forth in time to build in her protagonists’ personal stories while also moving forward with the actual plot. I admire the subtlety of the writing, and the intensity, and the way the world closes around you claustrophobically as you read the novel . . . and that’s why I would probably not have wound up nominating it. That claustrophobic feeling. It’s a triumph of storytelling that I genuinely enjoyed Persona, because ordinarily a claustrophobic setting makes me pull away and maintain an emotional distance from the story. In this one, the protagonists – and most of the other characters – are so tightly closed in by their circumstances; honestly, it’s unbearable to imagine living that way. Practically every move they make and word they utter is witnessed by an audience, and there’s betrayal on every side and (almost) no one you can trust. The whole idea just makes my skin crawl. Also, celebrity pop culture is simply not something I get. If I lived in that world, I would be oblivious to the Faces and baffled by the fascination they exert on everyone else, just as I’m oblivious to and baffled by celebrities today. On the other hand, I really love Suyana and Daniel. Plus this book is such a great example of how you can have high and rising tension with relatively little action. It’s an intense reading experience, not something to pick up lightly and read casually. But after finishing Persona, I immediately picked up the just-released sequel, Icon. The first book was pretty well self-contained, but I am eager to see how Suyana meets the new challenges she faces. Also, I would like to see Margot go down. I feel like such a book pusher now! But I’m very pleased that you liked both Peas & Carrots and Persona. I have Icon out now and need to read it soon. No, it’s definitely not just for you. I do this a little *too* frequently. I feel like I have to get all the books I don’t like out of the way first, before indulging myself. Which means I end up reading way more books I don’t like than I need to. But I’m getting better at this. Life is short, after all. Rachel D, I think the important trick is to learn to put a book DOWN when you don’t like it. That too me a while, but I DNF a lot more books these days than I used to! Maureen, keep it up! How else would I find books I love but wouldn’t ordinarily read? I also sometimes read things I don’t really want, rather than begin a new book I’ve been looking forward to. This happens especially if I’m feeling brain-dead, tired, or know I’ll be having to do something else within the hour. I just won’t have a lot of time to get into the new one. That’s when I do samples and otherwise look at those things that have been aging on the Kindle. Unless the multiple page list has gotten to me and I’ve decided I really need to go through them all and clean it out. I still haven’t finished SUNBOLT, but I did enjoy Memory of Ashes.